Over the last week, from local to national news, everyone has been commenting on the likelihood of being in the path of the falling Chinese space station. The chance of being hit by debris was one in a trillion, they said. My question would be, how did they ever find data to come up with that or any other statistical figure? Mike Massimino gives a full explanation of why the Chinese space station is going to come down soon. Massimino calmly explains again, without missing a beat, proving why he is the usual face of NASA. Well, the wait is over. The space station hit open water in the Pacific last night. This isn’t the first space station to fall out of the sky, out of control. American’s first space station did the same in 1979. To see what happened then, go to 299. I Survived Skylab. For a full report on that space station, see 297. Skylab 1 and 298. 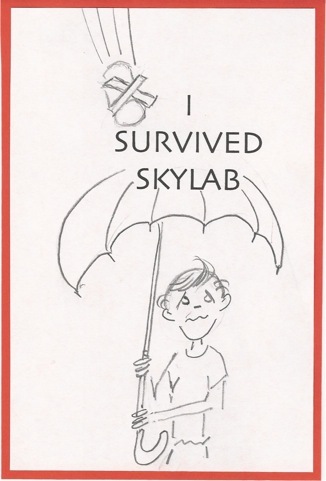 Skylab 2. This entry was posted in A Writing Life and tagged writing on April 2, 2018 by sydlogsdon. Yay! I did not get crushed by a fiery hulk of metal from the sky! When I was your age, we also worried about intentional fiery metal falling from the sky. Oops, maybe that hasn’t changed so much, after all.